How to add the premium touch to your care home bedrooms without spending a fortune! 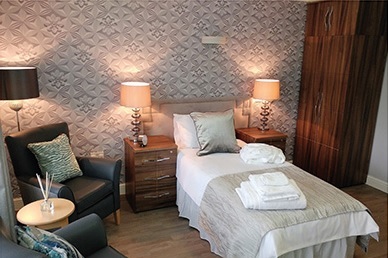 Over the past year, the team at Dayex have noticed a real trend in customers uplifting their care home bedrooms to encourage private or higher paying residents into their care homes. In a market that is becoming increasingly competitive combined with residents and their families’ standards getting higher, creating great bedrooms can have a real impact on future success. Uplifting your care home bedrooms doesn’t have to be an expensive exercise. Even small changes that often go missed can have a huge impact on the saleability of the bedroom. 1. Colour: Colour plays a huge role with residents both in assisting in their mood. Pale colours can make areas seem larger and warmer colours make room seem cosier. 2. Wallpaper: Using wallpaper in care homes isn’t a new trend. However, the style and application of wallpaper can have a massive visual impact on uplifting a room, especially when used on the bed head wall. Using subtle stripes or textures on a prominent feature wall and combining it with paint colours that compliment it to add the wow factor. 3. Drapery: Curtains Size and shape are just as important as fabric choice for curtains. You can uplift the look and feel of a bedroom by adding full length curtains. The cost doesn’t have to be high. For example at Dayex we offer eyelet curtains 1.6m x 1.6m for £157 + Vat. Full length curtains 1.6m x 2.2m is only an additional £23 at £180 + Vat. 4. Cushions and bed coverings Cushions and bed coverings can make any divan or profiling bed seem homely and inviting. Quilted bed throws are a great way to add a touch of luxury when combined with a patterned bed runner. Try to mix and match different shapes and sizes of cushions. Try using different colours/fabrics that tie any chair and the curtains together. 5. Accessories It’s the small things that make all the difference. Adding a nice co-ordinating lampshade or a framed mirror can make all the difference in a room. Artwork in bedrooms can make a real impact also. 6. EXTRA TIP – Furniture: Furniture ties everything in the room together. Under-furnishing can make a bedroom seem sparse or empty and over furnishing can make a room feel cramped. Balance is key here. For example, if you have a large room then look at having a bedside table either side of the bed. Perhaps two chairs and a coffee table? Maybe cabinets made from premium materials like real oak. Our Alderbury range is made with oak veneer and instantly adds a premium feel to the room or the unique colouring on our Winscombe grey cream to add a more modern touch. Dayex® are changing the market from weeks to days with a nationwide 5 day delivery service on furniture and soft furnishings including made to measure curtains. Our service allows both individual care homes and large healthcare groups to refurbish rooms in a much shorter turnaround time. We help our valued customers maximise their care home occupancy, minimise room downtime and reduce revenue lost caused by long delivery times. Next Article Appropriate seating makes a HUGE difference to people’s quality of life.